China's ICBC Standard Bank, the world's biggest bank by assets, has agreed to buy a massive vault in London. It will be the first Chinese lender to own a vault in London as it looks to grow its precious metals business. The vault, which is in a secret location and is being sold by Barclays, can hold up to 2,000 metric tons of gold, silver, platinum and palladium. The deal will give ICBC more influence over trading, pricing and storage of precious metals. No financial details were given but the deal is expected to be completed in July. China accounts for more than a quarter of global gold demand but trading of the yellow metal remains centred out of London and New York. 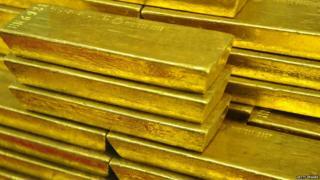 Around $5tn (£3.5tn) in transactions were handled in London's bullion market last year. Why is a Chinese bank doing this? ICBC Standard Bank's head of commodities Mark Buncombe said the purchase "enables us to better execute on our strategy to become one of the largest Chinese banks in the precious metals market". Last week, ICBC became a member of London's precious metals clearing system, which is where trades are settled. As ICBC takes on more Western clients, the bank needs infrastructure close by to store the physical gold or metals. Barclays, meanwhile, is exiting the precious metals business as part of a restructuring aimed at making the bank smaller and more focused. What do we know about the vault? The vault is one of the largest in Europe and took more than a year to build. It was opened in 2012 by Barclays, which says it is located within the M25 motorway that circles London. Who else owns these vaults? The London bullion market has seven providers of vault storage services, including the Bank of England, HSBC and JPMorgan Chase.